I'm Kyra Prime!The daughter of Primus and Solus Prime,and the leader of Prime Elementals,my team on Cybertron.My abilities are controlling the elements,creating any weapon I think of,and many more. Ask me any questions! I'll try and answer them. Thx for 171 mini-Primes and Sparklings! 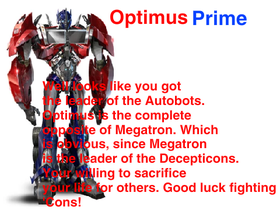 What Transformers: Prime Character are you? which one should i chose?? Want me to draw your oc?